Is Taking Prescription Fish Oil Right for You? Prescription fish oil, brand name Lovaza, is a relatively recent addition to the market of pharmaceutical health products. With all of the affordable fish oil supplements available in health food stores, is making the investment in prescription fish oil worth it? Many doctors feel the answer is yes. Fish oil contains Omega-3 fatty acids, which are an important part of your diet. In the typical Western diet, the ratio of Omega-3 to Omega-6 fatty acids is too low, which can lead to all kinds of health problems ranging from increased inflammation to high blood triglycerides. Omega-3 fatty acid supplementation can bring this ration of Omega-3 to Omega-6 fatty acids into a healthier balance and help prevent a number of diseases. Prescription fish oil is used to treat very high triglycerides. Triglycerides are part of your blood lipid profile. They are a sticky type of blood fat that is a necessary part of your blood; however, in high concentrations triglycerides can contribute to metabolic syndrome, diabetes and heart disease. Prescription-strength fish oil has also shown some efficacy in treating autism. Currently, Lovaza is the only brand of fish oil available with a prescription. Lovaza is an FDA-approved medication available only with a doctor's prescription. It is manufactured by GlaxoSmithKline, a well-known pharmaceutical manufacturer. According to the Lovaza website, it is a purified and concentrated fish oil, which makes it far stronger and safer than fish oil you can purchase in a health store. As a matter of fact, GlaxoSmithKline says you would have to take 14 capsules a day of health food store fish oil to get the strength you receive in four capsules of Lovaza. GlaxoSmithKline also states on the Lovaza website that in order to obtain FDA approval, their product has to be extremely pure and manufactured under stringent controls that are lacking in the health food supplement industry, which is the other primary source of over-the-counter fish oil. There is some validity to this argument. In his book, Protein Power Life Plan, Dr. Mike Eades talks about over the counter fish oils and how a large number of capsules in any container of fish oil are likely rancid. To counter this, Eades suggests chewing at least one fish oil capsule every few days in order to check for rancidity. Lovaza's manufacturing and purification process may help eliminate the worry of this well-known issue with over-the-counter fish oils. Lovaza is meant to be taken in conjunction with a healthy diet, exercise, and in some cases, a weight loss regimen and lowered alcohol consumption. Common side effects of Lovaza include burping, infection, flu-like symptoms, upset stomach, back pain, skin rash and a change in sense of taste. It may also have an effect on liver function and cholesterol testing. Tell your doctor if you have diabetes or a pancreatic disorder. Talk to your doctor if you consume more than two alcoholic beverages per day. The effects of Lovaza on an unborn baby are unstudied and unknown. Therefore, Lovaza may be contraindicated during pregnancy or nursing. If you have hypothyroidism, talk to your doctor before taking Lovaza. Lovaza may interact with certain medications and reduce the efficacy of other medications. It is important you talk with your doctor and tell them all of the medications you are taking including vitamin pills, prescription and over-the-counter medications and herbal supplements. The regularly prescribed dosage of Lovaza is four capsules a day. Capsules should be taken at the same time every day, and can be taken in either one dose of four capsules or two doses of two capsules each. Capsules should be swallowed whole - not broken, chewed or crushed. Lovaza should be taken in conjunction with a low fat, low cholesterol diet. 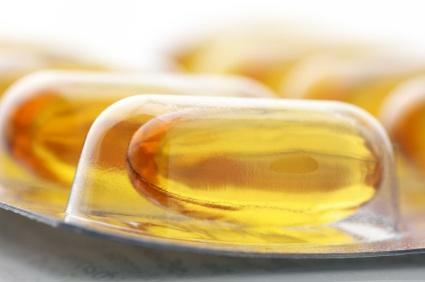 If you have high triglycerides, then obtaining a prescription for Lovaza fish oil might be right for you. Talk with your doctor to discuss the benefits and drawbacks of taking either Lovaza or over-the-counter fish oil.